Otterspool is a little over a mile from where I live and as you can see from my photo, it is a pretty, tranquil place. Or so it may seem. What you don’t see is the busy A627 road behind me as I stood on the bridge over the River Goyt, where Otterspool Road becomes Dooley Lane. 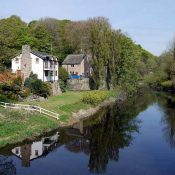 The social enterprise company, H2oPE, has put forward plans for a community-owned micro-hydro plant to harness the power of the river waters. 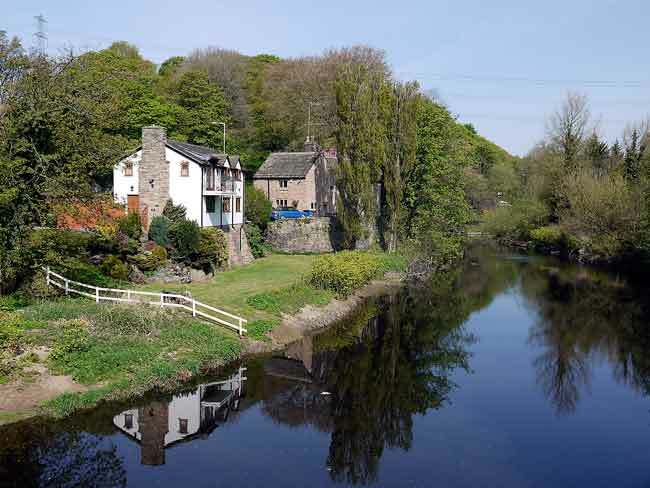 The project will use reverse Archimedean screw and the industrial age weirs that were once used to power water mills to generate electricity to power 50 homes. 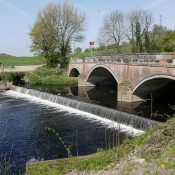 The photo on the right shows the other side of the bridge and the weir. 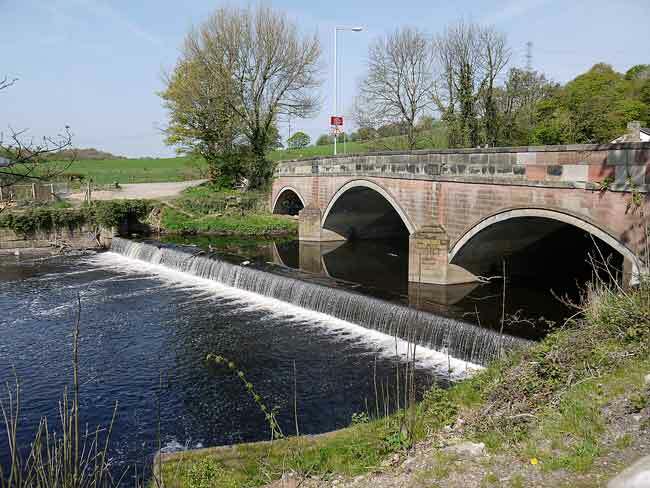 The micro-plant will be installed further downstream. The scheme has been welcomed by Stockport Heritage, Friends of the Earth and local politicians and shares are being offered to the public at £1 each. But while Otterspool is looking forward to a future of renewable energy, it also casts a look backwards to the age of steam. Well sort of. 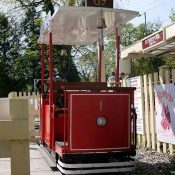 Otterspool Junction is the main ‘station’ for the miniature railway at Wyevale Garden Centre which is next to the featured bridge. 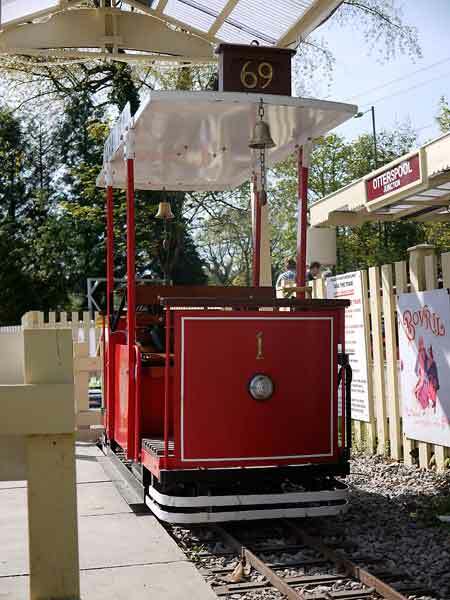 Dragon Miniature Railway has run the half-mile dumb-bell shaped circuit since 1999, operating the Flying Dragon, Western Champion, and the two steam locos, Princess and Lady Pauline. Above is Tara the Tram which you can drive yourself on 250 feet of track at a maximum speed of two and a half miles an hour. it does look tranquil. too bad about the traffic. It looks and sounds charming. I live in the big city – nothing charming about it. Exciting maybe, but not charming. Very lovely and peaceful place…would like to visit. That is a charming site. Exciting news about the micropower plant. I have a cousin in Idaho, here in the USA who lives on a remote ranch they have a micropower plant powered by water from a creek that runs through the property. It works very well and it much quieter than the diesel generator they had for years. Reverse Archimedean screw ? That’s a favourite with Jordan aka Katie Price! I take it that there was once an abundance of otters in the pool? Any left?